Rinse the leaves well in warm water, shake dry and set aside. In a large bowl, thoroughly mix the other ingredients, reserving 2 tbsp oil and 1 tsp tomato purée , and season. Lay out the leaves, veiny side up, and roll 1 tbsp of the mixture in each leaf. Place the parcels in a large casserole. Mix the remaining tomato purée and oil with 400ml cold water and pour over the koubebia so they are almost covered. Cover the casserole with foil. Bring to the boil, reduce to a gentle simmer and cover with the lid. 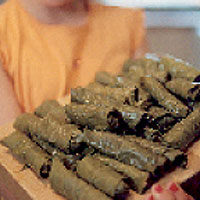 Cook for 45 minutes–1 hour, until all the liquid is absorbed and the leaves are tender. Allow to cool before serving.